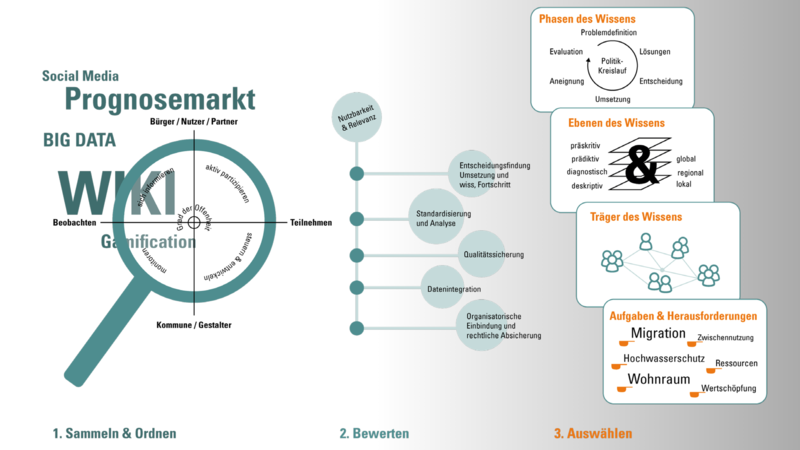 Gamification, Prediction Markets, Wiki & Co: New Knowledge for the City? 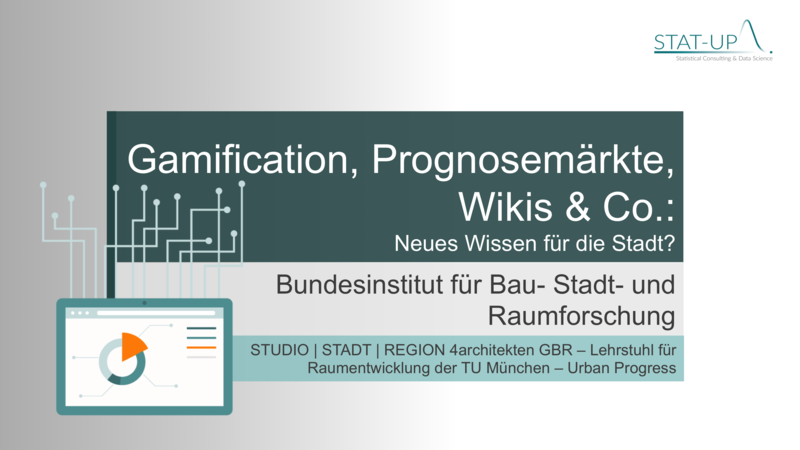 Together with STUDIO | STADT | REGION, the Chair for Regional Development of the TU Munich and Urban Progress we won in 2015 the tender bid for the research project Gamification, Prediction Markets, Wiki & Co: New Knowledge for the City? Utilizing the ongoing development of data mining and – evaluation for local self-government, urban development and research. Concatenating and discussion of existing as well as development of new methods. 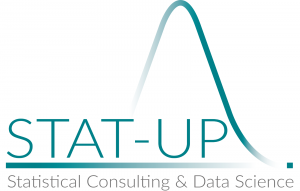 Building extensive database of actual applications with focus on new, innovative methods for data mining and data use. Discussion of relevance and usefulness based on a newly developed criteria scheme. Assessment criteria guide for digitization projects. Potential detection for employment of novel methods and new technologies. This project is part of the research program ‘Experimental Housing and Urban Development – Smart Cities of the Federal Institute for Research on Building, Urban Affairs and Spatial Development (BBSR). The ongoing development of data mining and – evaluation created new methods of obtaining knowledge. Gamification, wikis, prediction markets, and big data analysis offer current possibilities for extracting knowledge. The project contains the concatenating, discussion and new development of methods for knowledge extraction from the perspective of local self-government, urban development and research. Our research was conducted on national and explicitly on international level, and brought a variety of innovative and promising methods for data mining and – use, for which we built an extensive database. To select those examples, whose application is of use to the needs of a municipality and their inhabitants, and/or in general to enable evaluation and assessment of digitization projects, we developed a detailed evaluation pattern. This balances relevance and usefulness against each other – with view of the technical, organizational, and in particular on the civil-societal level. Owing to this approach we succeeded in deriving promising and at the same time very specific use cases with the potential to support and extend many local government units. Click on one of the images to access the publication.